* Features a concise introduction to atomic and nuclearphysics. * Presents a range of nucleonic measurement methods andhighlights their application to a variety of problems. * Contains an overview of electronics, measurement accuracy,safety and standards. * Considers processes and demands, design strategies andpractical realisation of measurement systems. * Provides many practical engineering examples. Offering a comprehensive coverage of engineering applications,this book is an essential tool for electrical, electronic andinstrument engineers in the oil and chemicals processing sectors.It is also a valuable reference to graduate students and physicistsinvolved in nuclear radiation measurement, medical applications,radiochemical research, environmental monitoring and chemicalengineering. Geir Anton Johansen is the author of Radioisotope Gauges for Industrial Process Measurements, published by Wiley. 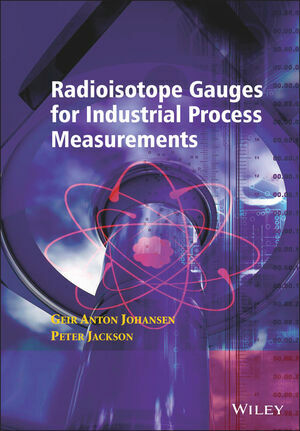 Peter Jackson is the author of Radioisotope Gauges for Industrial Process Measurements, published by Wiley. 1.2 Industrial Nucleonic Measurement Systems. 1.4 The Objective of this Book. 2.1 A Primer on Atomic and Nuclear Physics Emissions. 2.4 Sealed Radioisotope Sources versus X-ray Tubes. 3. Interaction of Ionising Radiation with Matter. 3.2 Attenuation of Ionising Photons. 3.3 The Attenuation Coefficient of Ionising Photons. 3.4 Attenuation Coefficients of Compounds and Mixtures. 4.2 Detector Response and Spectrum Interpretation. 4.3 Purposes and Properties of Detector Systems. 4.9 Stopping Efficiency and Radiation Windows. 5.2 Data Processing Electronics and Methods. 6. Safety, Standards and Calibration. 6.1 Classification of Industrial Radioisotope Gauges. 6.3 Radiation Monitors and Survey Meters. 6.5 Transport of Radioactive Materials. 6.6 Leakage Testing of Sealed Sources. 8.2 Rationale for Using Radioisotope Sources. 8.4 Dual Energy Density Gauge. Appendix B: Formulae Derivation and Examples.